South Korea was never on my trava-radar: high tech, amazing infrastructure, easy access, omnipresent wifi… Why should I visit? Apart from mainstream history, culture and wild Korean tv drama, I was clueless, and a loser (literally too) for purposely steering clear of Korean cuisine. With limited time, I usually run to China Towns, because I spend the majority of my time in big Western cities rambling down China Towns. I also assumed Korean cuisine to be spicy as hell because in my mind Kimchi looked deadly and whatever spicy. Nevertheless, I spent 8 days eating my weight across various provinces in South Korea. Hiking and 6 hour – strolls around Seoul’s districts and parks with 50% gradients (ok, I’m exaggerating) are no excuses to binge eat! I did anyway because #yolo, I knew I wasn’t going to eat anything like this back home, and boy was I right. We spent the first couple of days at Jirisan Spa Land Hotel, close to a bunch of mom and pops where we lunched and dined on homemade standard dishes and lots of healthy sides. Sometimes we’d have the same meals every day. For some naughty calories, we checked out TOM N TOMS, local Starbucks: Honey cheese bread and not so Asian: coffee Americano, and because I don’t know what Koreans eat for breakfast? After a couple of days of hot springs dipping and saunas, we took our relaxed selves for a tamed adventure to the terraced Green Tea plantations of Boseong, a couple of hours away. Perfect in October, with hardly any selfie taking tourists around, we admired the lush and neatly maintained tea farm. We walked up a flight of stairs and looked out at rows and rows of interminable green terraces. We had lunch in the farm, which surely didn’t live up to tourist trap meals you’re forced to eat when you’re in the middle of nowhere . Anyhow, here is where I acquired a taste for cold noodles and I can’t seem to get it out of my palate. We drove to Suncheon, famous for massive colony of reeds that swayed in the light breeze while we walked around the Ecological park. Later, we checked into SKY Motel, right in the city center, with an unusual Lexus sign on its facade. After a few days of pure relaxation, a night sleeping on the floor is just what you need, leading the way to a surprisingly expensive Dunkin Donuts breakfast because there was McNothin to eat on the cheap. Simple eggs? Toast? no? Anyway, we headed to our last stop before Seoul, Jeonju. Jeonju which goes back to a thousand years ago, has over 700 hanok houses, and is famous for a particular dynasty I haven’t wised up to, filming Korean drama and BIBIMBAP. Bean sprouts and raw beef are key ingredients that make it special. We walked around the hanok villages, which felt a little bit unnatural, because everything was in perfect order, until we encountered a Christian Missionary who guided us to A particular restaurant, among other things we didn’t follow. FINALLY, we made it to Seoul! Like in any other big city, we walked around and wandered. At times we felt old (night in Hongdae, university district), at times we felt young (walk in the park that cut through the city), and at times we were in the right place (Samcheong-dong). And in my case, city holiday is not complete if I don’t spend at least ONE NIGHT hunting down a restaurant recommended by a food blogger/trip advisor/local sources, which induces the urge to go around in circles, walk in and out of restaurants and finally end up eating ANYTHING out of exhaustion. Most of the time, it gets pretty bad. So, I was looking for a particular Japanese Izakaya recommended by a food blogger. #totalfail After going around in circles, we came across the oven chicken and beer joint we went to the night before. I was relentless. For some bizarre reason I wanted to have Japanese food in Seoul. (Because Japan right around the corner? No, I’m just an idiot) The next day, we walked from Myeondong to Itaewon, 3kms walk, that felt like 30kms, and I insisted on having Japanese for lunch. We did. It didn’t make it to the gallery below because we were miserably disappointed. You make my mouth water with your words and photographs. 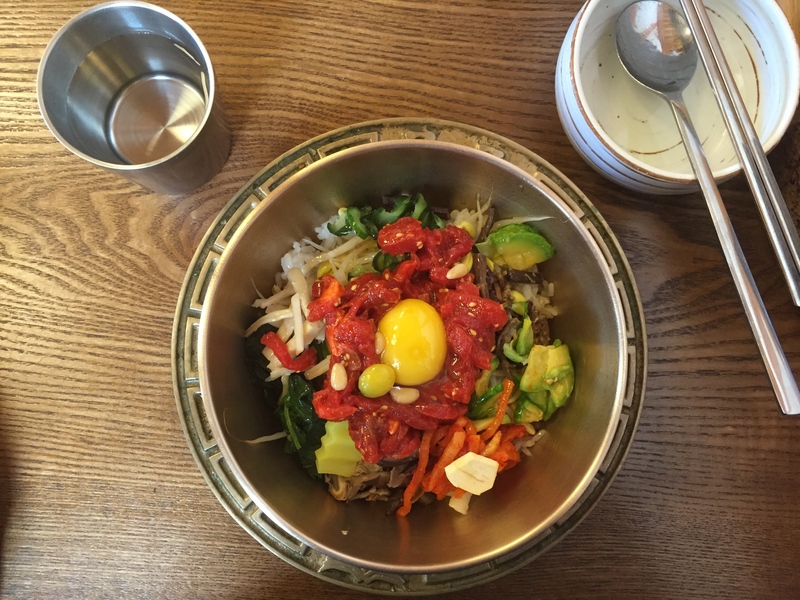 I lived for a year in South Korea, and your blog post is bringing back some amazing food memories. Thank you for taking me down memory lane. Thanks for visiting! I loved it and would definitely go back !